Remember my curbside find? 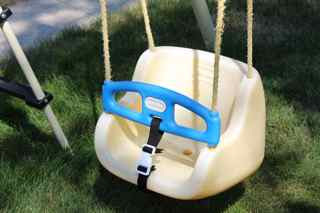 Yes, during my little city, ND annual curbside clean-up days, I found Mur-Man an awesome toddle swing, but there was ONE major issue. 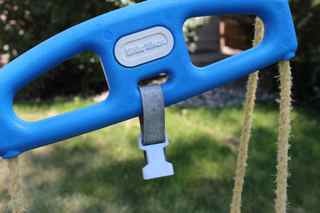 The current clasp was broken, but this is a simple fix. 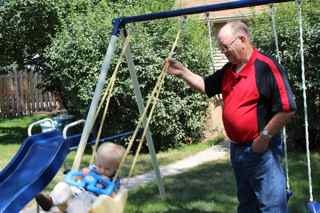 First up, you must know that Steve and I (or I better say Crafty G-ma and Handy G-pa) purchased Mur-Man a swing set. Steve and I researched extensively what swing set would work best in our yard, fit within our budget, and suit Mur-Man the best. We decided to purchase a metal swing-set at Wal-Mart and shipped it site to store (FREE SHIPPING). Not a permanent location...once the sod is set--it will move. 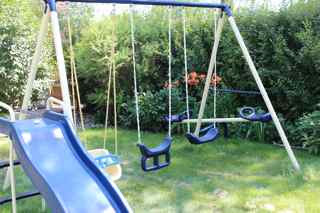 We found that the metal swing sets were a much better bang for the buck versus the wooden options and decided to go that route. In the end, the swing set cost us just over $140.00 (or cost my mom and dad), but we are very satisfied. 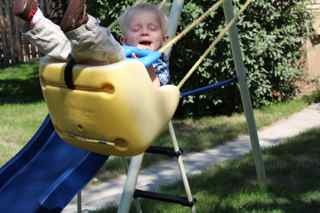 Not only that, but the FREE swing works great and Mur-Man loves SWINGING! But it needed to be repaired. SUPER EASY. The clasp cost just under $2.00. The strap/belting ribbon was FREE! 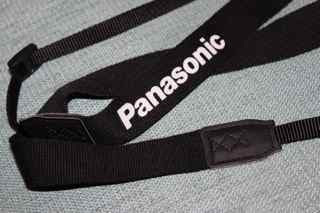 I simply used an old camera strap that fit perfectly. The best thing about this project is that it was a NO SEW FIX. 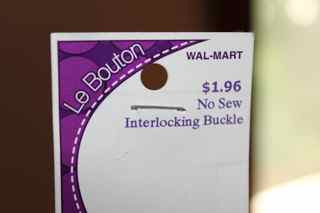 Simply cut the belt and loop it up. Also, Handy G-Pa re-attached the lower strap with the original screw. The old strap was filthy! SIMPLE! EASY! AND THE SWING COST ME $2.00! Pretty WOM-WORTHY…RIGHT! Handy G-Pa (my dad) giving Mur-Man a ride! There's a lot of great items on here. I definitely feel like.Thank's for sharing. you've shared great post. 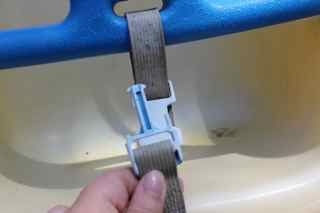 I've got how to re do a toddler swing. your swing is really awesome. Yes , i also worry about that too, we should take our kids with all thing that you think is safety.